Kathy Mazza, Port Authority Officer, NYC The first female Port Authority Officer to be killed in the line of duty, Captain Kathy Mazza died while evacuating people from Tower One of the World Trade Center on September 11. Her clear-headed decision to shoot out the glass in the lobby, enabled hundreds to exit more swiftly. Three percent of the Port Authority Police Department perished that day. Having earned a nursing degree before joining the PAPD, Kathy rose through the ranks and became the first female commandant of the Training Academy, leading its emergency medical programs. The regional Emergency Medical Services Council of New York City named her the 1999 Basic Life Support Provider of the Year. Yamel Merino, Emergency Medical Technician, NYC. Born to Dominican immigrant parents, Yamel Merino earned her EMT certification at Westchester Community College where she received the Chancellor’s Award for scholastic excellence. She worked for MetroCare Ambulance of Westchester County, and was MetroCare’s EMT of the Year in 1999. 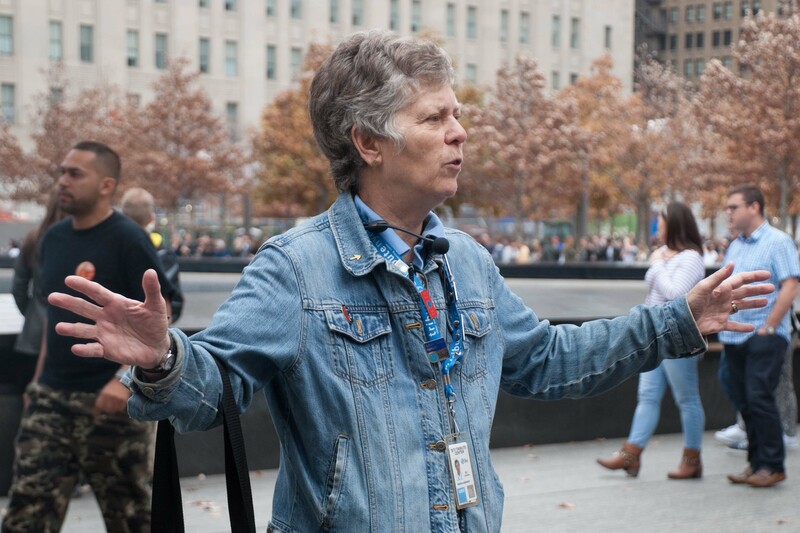 On September 11, she was among the first rescue workers to reach the World Trade Center site. She volunteered to enter the burning building. She was survived by an eight-year-old son. Moira Smith, Police Officer, NYC. Assigned to the 13th Precinct, Moira Smith had been a member of the New York City Police Department for thirteen years. She was the first officer to report the World Trade Center attack, when she witnessed the first plane hit, and rushed to the site. She was killed while evacuating people from Tower Two, and is credited with saving hundreds of lives that day. A New York Daily News photographer captured an image of her helping an injured man out of the towers. After finding him medical assistance, she returned inside to continue with the evacuation. Survived by her husband, also a NYC police officer, and a two-year-old daughter, she was buried on what would have been her 39th birthday. 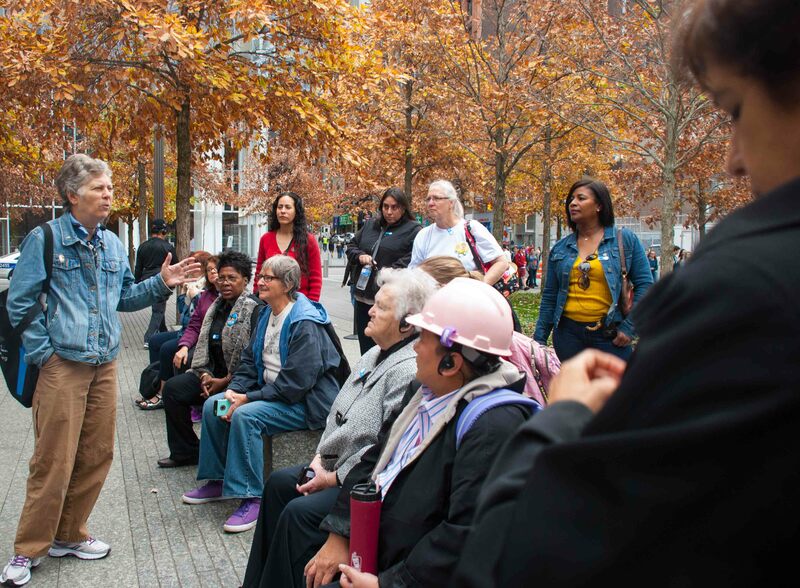 Deepest thanks to retired NYFD Captain Brenda Berkman for leading a group of tradeswomen on an amazing tour of the 9/11 Tribute site last fall. We were honored to have 3 other First Responders as part of our group: Con Ed employees Sharron Sellick, Monica Harwell, and Denene Ferguson. I was so moved by what was shared on the tour that day. 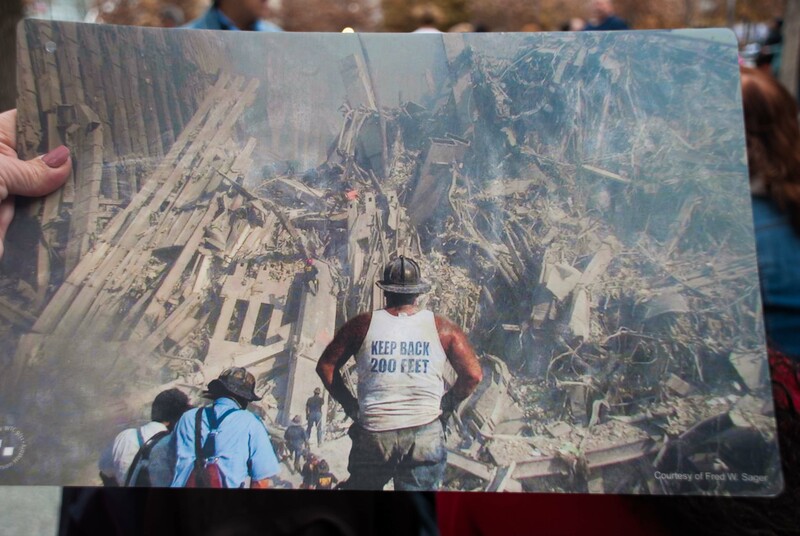 About the incredible camaraderie and solidarity and courage of New Yorkers on 9-11. The depth of personal loss. The devastating health consequences for First Responders. And that when 600 new firefighters were hired to replace those killed that day and the early retirements—NO women were hired. Because no women firefighters died on 9-11 (there were only 20 in the NYFD at the time). A reminder that human beings are complex. Susan, thanks so much for this remembrance. What are the pictures of? I recognize Brenda Berkman in the first two. It’s explained in the paragraphs at the end. 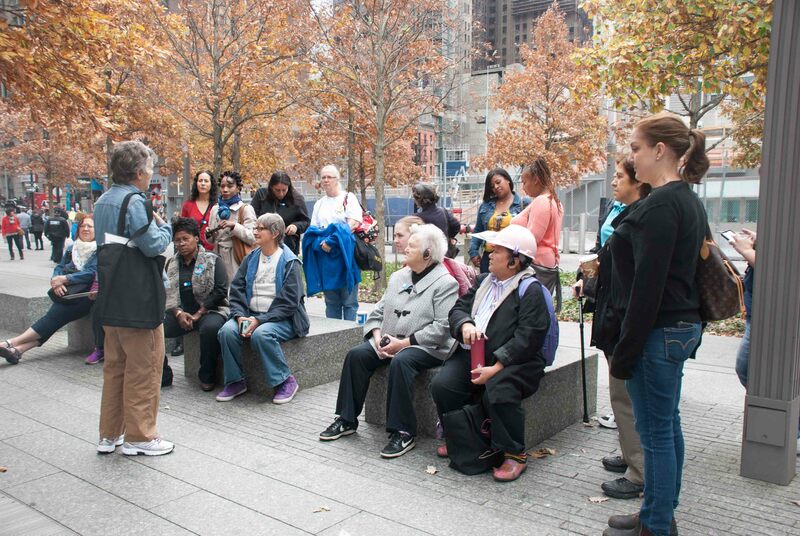 Last fall Brenda led a special tradeswomen-only 9-11 Tribute Tour that Melinda Hernandez and I organized. It was an amazing day! Ok. Duh. I didn’t get that. I’m Proud to Have Been A Part of this memorial tour led by one of the greats! Thank you, Susan, for your continuing contributions, not only for our 9/11 heroes, but for all the women across our great nation who strive to learn to work a skilled job, with good pay and are honored and compensated with the knowledge and pride of a job ‘well done ‘, even when we may be the only ones who truly know and appreciate the REAL cost to our minds, bodies and spirits. You Go, Girls! It’s discouraging to realize (percentage wise) that we are in the same place now as we were 36 years ago ,,, but we can always hope and pray that more women will be able to take advantage of entrance opportunities when able and have the guts to stick with it! Thanks, Susan ! MOVE the DECIMAL POINT! blog If 1978 affirmative action regs had been enforced beyond the first few years, women would be 25% of the construction workforce -- rather than 2.5%. "We're all experts on justice!" © Susan Eisenberg, 2014. All rights reserved. On Equal Terms installation going VIRTUAL! April 2018!